I really enjoy card making: learning new techniques, perfecting older ones and taking as much time as necessary to do it. Somehow I find myself loaded up with the patience that I don't seem to be able to summon in other aspects of my life! BUT ... occasionally time is not on my side and I just need to make some cards quickly and easily. Enter the Memories & More Card Pack called Merry Little Christmas! I haven't yet developed a taste for memory keeping but this card pack is also great for card-makers. These four cards basically assembled themselves in a matter of minutes! They're simple, require minimal equipment but are still imbued with the Christmas spirit! 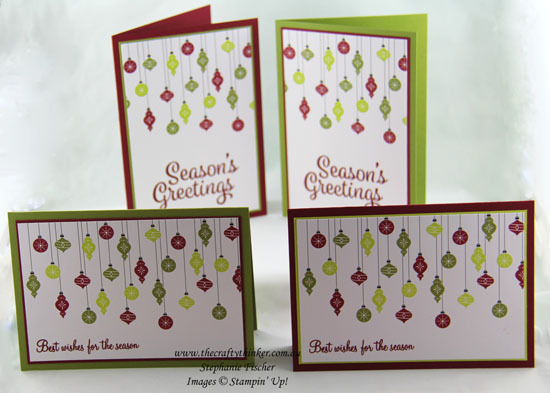 The large sentiment is from the new Snowflake Sentiments stamp set in the 2017 Holiday Catalogue (available from 1 September) and the small one is from the Holly Berry Happiness stamp set in the Annual Catalogue (available now). I trimmed the decorative cards to size, stamped a greeting with Cherry Cobbler ink, layered them onto a piece of cardstock and adhered them to the card fronts.